The Aberdour Hotel is a little jewel in the Fife small hotel market and a most welcome change from large scale chain hotels. The charming 17th century coaching inn has been tastefully and sympathetically modernized while retaining many of the original features. The 16 well appointed bedrooms, all of which have en-suite facilities, are warm and welcoming with all the conveniences needed to make your stay relaxing and comfortable. 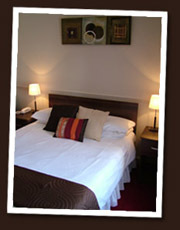 Single, Twin, Double and Family rooms are available as well as a small number of Superior rooms. Free WIFI internet access is available in most of the bedrooms and all of the public areas. The attractive hotel restaurant offers traditional Scottish cuisine prepared where possible with locally sourced produce. The imaginative selection of dishes changes regularly to reflect the seasons and provide our many regular customers with variety. Vegetarian and other special diets are happily catered for with advance notice making our task easier. A selection of lighter meals and real ales are also available in the welcoming lounge bar where you are sure to meet the locals who will be happy to give advice on what to do or see in the area. We are again included in the most recent edition of the Camra real ale guide. If you are contemplating a golf holiday whether it is for a weekend or a fortnight the Fife coast probably has the best selection of courses available in Scotland . There are courses to suit all standards including traditional links or parkland locations. Whether your handicap is 3 or 23 you will find courses to suit and challenge you in Fife. There are more than 50 courses in Fife within a 30 minute drive including the Championships courses at St Andrews, the great Carnoustie Links , the delightful parkland course at Ladybank and the stunning coastal links at Elie, Leven, Lundin Links and Aberdour itself. The First in Fife golf pass for 3 or 5 rounds is available from the hotel and permits visitors to play many of the courses in the area at very competitive rates. The Aberdour Hotel offers great value golf breaks. Best to call the hotel for details and help in planning your golfing holiday in the Kingdom of Fife.